Day 386: 14, 630 Miles, Currently HOME!! We met at Keuka College in NY where we studied childhood and special education. We also spent a lot of time riding around the beautiful Finger Lakes Region. We have completed two bicycle tours together, both of which were while we were still in college. Our first tour was in the summer of '09 when we spent 3 weeks riding from NY to ME and back. In doing so rode through VT, NH, MA, and CT. The entire trip totaled about 1,500 miles. 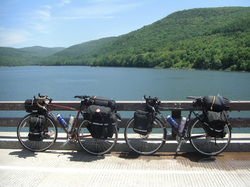 In the summer of '10 we rode from NY to FL and back. It took us 3 weeks to arrive in FL. On the trip down, we visited Hershey and Gettysburg, PA and Washington, DC. Our return trip took a little longer since the route was much more mountainous. We rode through the Great Smokey Mountains and traveled down the Blue Ridge Parkway where we climed Mt. Mitchell. The entire trip down to FL and back to NY took a total of 57 days of riding (there were days we spent sight seeing as well) and we covered a total of 3,880 miles. Upon completion of the trip we were able to add NJ, PA, MD, VA, NC, SC, GA, FL, TN, and WV to our list (and technically OH too, but we didn't get a picture by the state sign because we crosed the OH river, so I don't count that state). Ever since we rode from NY-ME and back in the summer of '09 we have made it our goal to ride to every state in the US. Since then we've ridden to 16 states and Washington DC. Although this is something that we planned on doing in 5-7 years, we realized that there was no better time than right now. We don't have full time teaching jobs yet, and when we do get one, we aren't going to want to quit. So, we figured out everything we needed to do in order to make this trip possible and began to pack. Our goal for this trip is to ride through all of the states that we haven't ridden through yet (with the exception of Hawaii, of course). We expect that our trip will take around a year to complete. In that time we plan to visit as many of the destinations on our list a we can. Also, a highlight of the trip will be taking a cruise from Anchorage to Vancouver (taking this alternate form of transportation for a little while is necessary in order to avoid the winter weather we would get stuck in if we road back from AK and make the rest of our trip possible). We are riding Trek 520s. They are pretty much like road bikes, but are built to handle the weight of all the gear. They also have a little hunkier tires which come in handy for those bumpy roads. These are also the bikes we rode on our last tour. "It's not about the destination, it's about the journey"